Our Level 3 First Aid at Work Requalification is for people needing to recap and continue certification. All first aiders must be requalified within 3 years of their certification date. Our Level 3 First Aid at Work Requalification will refresh your memory on first aid procedures, treatments and safety within the workplace. During this two day course, you will recap how to deal with a range of situations, from minor to life-threatening. The programme covers topics including cross infection, incident management, basic equipment use and how to report emergencies in line with your organisation’s procedures. Our experienced trainers will show you how to effectively treat casualties who are in life threatening situations; for example, if they are unconscious, choking, bleeding, in shock, suffering from a seizure or not breathing. Treatment of anaphylaxis, heart attacks, asthma and cardiac arrest is also covered in this training course. You will be assessed throughout the duration of the course and there will be a practical and theoretical tests. To revisit key areas of first aid with the delegate to ensure they have adequate knowledge to deal with minor and urgent medical problems in the workplace. 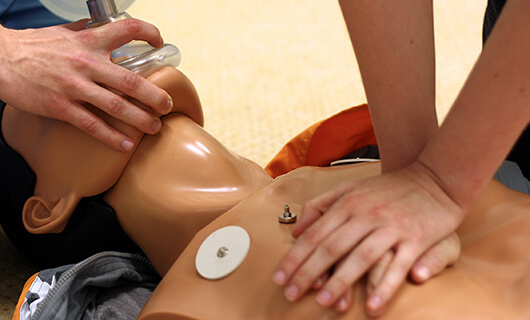 Candidates currently holding a First Aid at Work qualification can undertake this course. The students current certificate must not have expired more than three months before completion of the two day requalification. This course is ideal for anyone who needs to renew their qualification to continue at the first aider within their company. This programme is accredited by the First Aid Industry Body but can be accredited by Qualsafe Awards for an extra fee depending on your needs. Please let us know if you want it to be accredited by Qualsafe when booking. There must be a minimum of 6 people for this course to run. Contact us on 01772 433080 or via email at info@centaurtraining.co.uk to make an enquiry or to book.